Oops - we don't appear to have a video for the GT-20000N Pro. I would give the scanner 5/5 – although I am not a “techie”, I think this scanner is the best I’ve come across. It is easy to use, fast, feeds really well and produces full quality pdfs. It makes large scale jobs painless and has not let us down! Give your office advanced scanning performance to match higher cost scanners. Increase productivity effortlessly with fast speeds, the latest imaging technologies and easy to use features. Experience advanced performance with the Epson GT-20000N Pro. Combine A3 flexibility, fast scanning speeds and excellent reliability. Maximise efficiency and control with advanced features including RGB dropout, auto de-skew and text enhancement. Streamline document management. 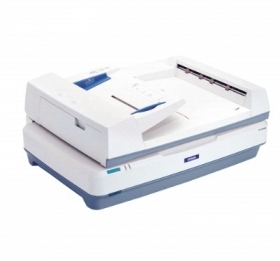 Scan multiple documents up to 23ppm mono and 15 ppm colour with the 100-sheet duplex Auto Document Feeder. Create a centralized scanning solution with the built-in Network interface. Capture maps, books, magazines in mono or colour at 600x1200 dpi. Simple integration into document management systems with TWAIN and ISIS® driver support. Fast, efficient Hi-Speed USB 2.0 and SCSI interfaces. Create a networked scanning solution with Epson Network Image Express Card. Epson Scan software with RGB colour dropout, auto de-skew, Text Enhancement 2.0 and auto page size detection. Meets strict ENERGY STAR® efficiency guidelines.